I have been a bit behind, March hit hard with the cold weather and me coming down with the flu. It seemed it took me a while to get my energy back and life back on track. I was one of the "Pay It Forward" winners on Donna's Designs Blog. Please click the link to her blog and read the sweet story about paying it forward and sharing the love. Also check out her beautiful cards that she makes. Tell her I sent you over. 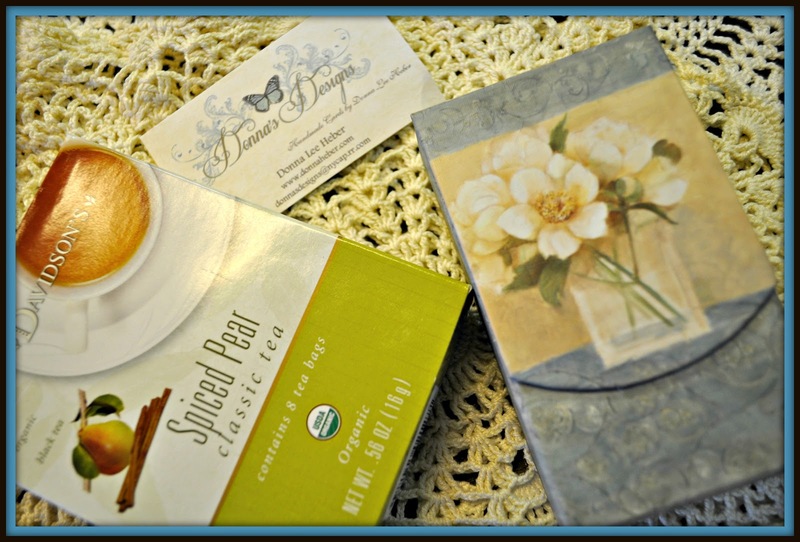 Donna sent me a wonderful package of Davidson's Spiced Pear Tea and some beautiful notecards. So, I am going to get back in the swing of things and going to do the same thing. I will randomly draw a winner on April 11th and will be mailing out a surprise package to that person in the mail that will either be a craft item created by me, a trinket, something new or something vintage. I will put extra touches to please the winner. So leave a comment and I hope you are the winner! And just like Donna, all I ask is that you do something nice for someone else that in some way you can show some kindness...a sweet note, buy them a cup of coffee, simply something to make someone else's day better. The spiced tea was perfect for your recovery from the flu! Glad to hear you are back in the 'swing'. :) Love the Pay it Forward concept! Hello pretty! a hug to you! !